Teams, caddies and supporters from Romsey, Hockley, Royal Winchester and Army arrived bright and early to be greeted by the first frost of the season! However, the sun soon came up, the frost disappeared and the first shots were fired in this year’s semi-finals. 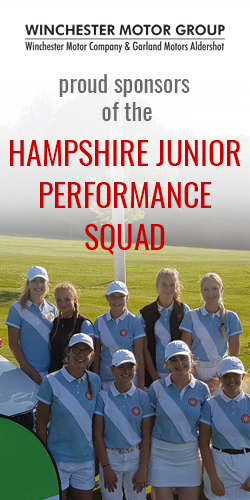 Romsey were fast out of the traps in their match against Hockley with 2 early wins on the board and although Fiona Williams pulled one back in the front match against Romsey’s Julie Cole, Romsey were able to secure 2 other wins which put them through to the afternoon final. Fiona won her match on the 20th hole and this was to set a trend for the rest of the day. The other semi-final between Royal Winchester and Army was a much tighter affair with the balance shifting one way then the other. Army struck the first blow with Royal Winchester soon levelling things up before another win each for Army then Royal Winchester (on the 20th hole) made the overall score 2 – 2. 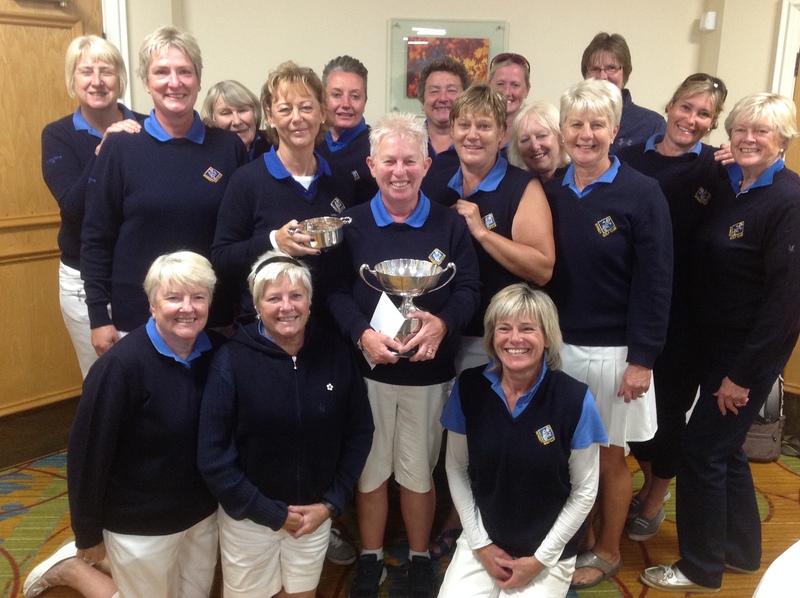 The 3 matches left out on the course were all tight affairs and it was difficult to predict which way it would go until Royal Winchester’s Judy Ames and Christine Pink finally won their matches to secure the 4 matches they needed. After a quick lunchtime turnaround the final got underway 15 minutes behind schedule with the sun still shining brightly. First blood went to Romsey with Morgan Peterson beating Jilly Wehbeh and news soon came in that Romsey’s Sue Rorrison had beaten Elise Witt to make it 2 – 0 to Romsey. In the front match Julie Cole (Romsey) and Gemma Duxfield (Royal Winchester) were having a great battle. Gemma gained early control going 3 up after 4 holes before Julie fought back and reduced the deficit to just 1 down at the turn. The match remained tight until Julie birdied the 13th to make matters all square then followed with further birdies on 15 and 16 to go 2 up with 2 to play. She held her nerve to win the 17th and secure a 3&1 victory and the 3rd point for her team. At 3 – 0 Romsey looked to be cruising to a comfortable victory but Royal Winchester had other ideas. 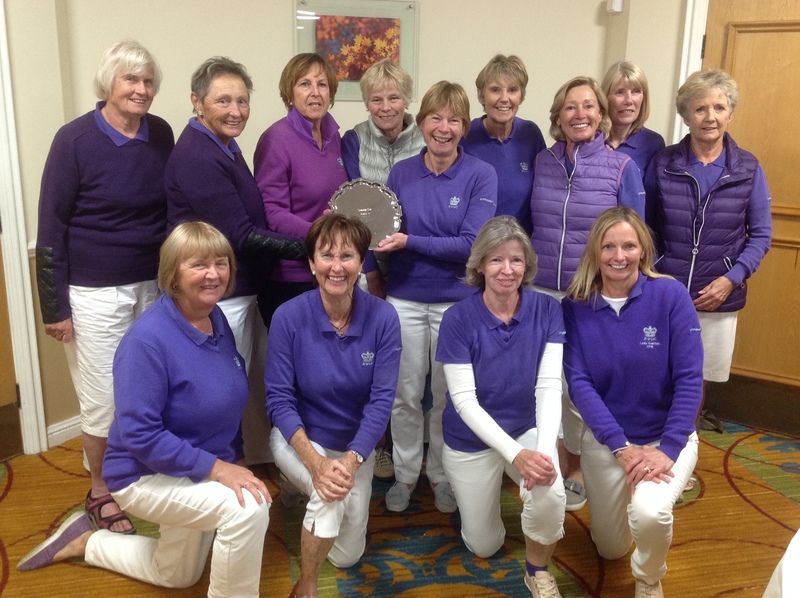 Moya Abbott managed to get the first point on the board for Royal Winchester as she won her match on the 18th then Pauline Davies beat Lucy Molland in another match to go to extra holes. Game on! Christina Pink (Royal Winchester) and Tracy Grimes (Romsey) had been having a great battle and their match ended all square after 18 holes so another match was off down the 19th. In the meantime Jill Sparkes (Romsey) and Sue Hitchen (Royal Winchester) couldn’t be separated as they played out the last 3 holes at all square and they too had to go to extra holes. As the sun went down and the light faded news filtered back that Christina and Tracy had halved their first extra hole so they were off down the 20th. In the final match Jill and Sue were both on the par 5 1st hole in regulation 3’s so it was down to the putting. Sue went first and narrowly missed her birdie putt but the par was conceded so over to Jill to see what she could do. Having hit an excellent 3rd to around 10 feet she held her nerve and managed to sink her putt for an excellent birdie much to the delight of the watching Romsey supporters. The cheer could be heard back down the fairway by the supporters who were peering through the gloom as well as the other match which by now was approaching the 20th green. It was a fitting way to end an exciting final and Romsey were crowned 2018 Stoneham Cup winners. Congratulations also go to Royal Winchester who fought all the way and were worthy runners up plus to Army and Hockley who had done superbly well to make it to finals day. Our thanks go to Neal Grist, Director of Golf and Meon Valley Golf Club for allowing us to use their course for our 2018 finals day. Particular thanks go to Club Captain Mark Venables who started all the morning matches, Ladies Captain Carolyn Szymanski who made sure things ran smoothly off the course and the team of lady members who acted as ball spotters in the morning. Finally thanks to Di Stock and her team of referees who ensured everything on the course went according to plan.